How Did SeaWorld Florida Handle Waterwork After Alexis Martinez Died? One of the key questions in the OSHA versus SeaWorld smackdown happening this week in a courtroom in Sanford, Florida is: how did SeaWorld’s parks respond to the Dec. 24, 2009 death of Loro Parque orca trainer Alexis Martinez, killed by a SeaWorld killer whale called Keto during a training session supervised by SeaWorld trainer Brian Rokeach? It is key, because it goes to the question of whether SeaWorld was indifferent to the risks waterwork and close contact with killer whales posed to its trainers. Mike Scarpuzzi, SeaWorld San Diego’s vice president of zoological operations, testified yesterday (according to my notes) that SeaWorld Florida, where Brancheau was killed two months later, took its trainers out of the water on Dec. 25, and returned them to waterwork on Dec. 27th or so. 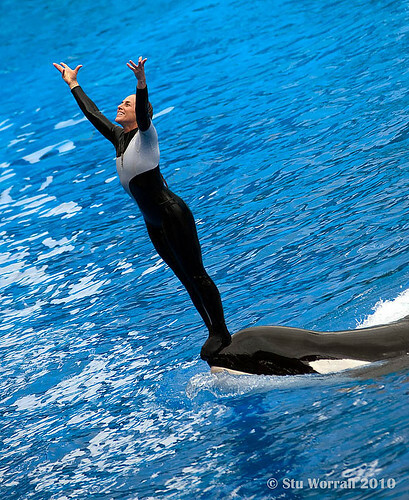 It was against this background that Flaherty-Clark said she, in consultation with SeaWorld Florida management, made the decision to return SeaWorld Florida’s trainers to the water. When I reported the story of Alexis’ death I went to great effort to try and figure out when SeaWorld’s parks removed trainers from the water in the aftermath, and for how long. Since SeaWorld would not tell me, with the help of a friend who is a master of Flickr searches, I turned to photo evidence. What Flickr photos of SeaWorld Florida’s Believe shows, in the days after Alexiss Dec. 24 death, seem to show is that SeaWorld Florida continued waterwork on Dec. 25 and 26, removed trainers from the water for one day, Dec. 27, and had them back in the water on Dec. 28. Of course, it is possible that the date setting on a camera might be wrong, but this photo of Dawn Brancheau, for example, explicitly says it was taken on December 25 (see the caption). And here is a waterwork photo from Dec. 26, and another from Dec. 28. I’ve published the full list of photos at the end of this post so you can see what you think of them, and decide what they show, yourself. If these photos show what I think they show, then Scarpuzzi’s testimony about when SeaWorld Florida was out of the water was not quite accurate, and SeaWorld Florida waited two days after Alexis died to pull its trainers from the water, and then kept them out of the water for only one day (the other parks waited longer). The other thing I have been wondering about how SeaWorld Florida handled the suspension and resumption of waterwork in the aftermath of Alexis’ death is: how much could Flaherty-Clark and SeaWorld Florida management have known about what happened at Loro Parque just two days after Scarpuzzi arrived in the Canary Islands to help Rokeach handle the tragedy and find out what happened? In her testimony Flaherty Clark discussed the incident report and video, but Scarpuzzi testified (according to my notes) that he left Loro Parque, to return to the United States to brief the parks on his investigation and show the video, on Monday, Dec. 28. So by the time he arrived in Florida, it appears that SeaWorld Florida trainers were already back in the water with the killer whales. And the decision had been made, it seems, before Scarpuzzi had made his full presentation on the incident, which included the underwater video, to the training team at SeaWorld Florida. Of course, Flaherty Clark and the management team at SeaWorld Florida may have seen a draft of the incident report before Scarpuzzi returned, or may have discussed its content with Scarpuzzi by phone. But it seems unlikely they had seen the video before ordering trainers back into he water, unless Scarpuzzi e-mailed it somehow over the weekend. I’d love to know when Flaherty-Clark first saw a draft of the incident report, and when she first viewed the video. Flaherty-Clark also testified that she discussed the decision to return to the water, which presumably occurred Dec. 27 or the morning of Dec. 28, with the trainers who would be going back in the water. But how much could they have known about what happened at Loro Parque if they hadn’t yet been briefed by Scarpuzzi, and hadn’t yet viewed the video, as appears to be the case? And from what I learned in my reporting about how SeaWorld handled Alexis’ death, trainers learned what they know about the incident from Scarpuzzi’s briefing and the viewing of the video. I don’t believe that the corporate incident report was shared widely with trainers, or made available to trainers in the way that SeaWorld incident reports normally are. Perhaps there are good answers to these questions. SeaWorld did not want to talk about this when I was doing my reporting, so I am piecing a timeline together from a variety of sources, and sharing the questions the timeline, if I have it straight, raises. It is a critical timeline, and the issues go straight to the heart of the courtroom battle between SeaWorld and OSHA. Good investigative debunking… but will OSHA see it? Even if OSHA were to see this article, it contains a great deal of speculation, which would serve little benefit to the hearing. Forensic tagging of photographs is extremely difficult to refer to, unless you actually retrieve the Meta-Data from the original digital image along with forensic information from the system the original photo was uploaded to . Simply looking at a reference data on a photo itself, or on the site data where the photos was uploaded, is not sufficient, as those data points can be effected so my many things and are easy to manipulate. For example, if an editing software is used on the photo, prior to upload, (to enhance color, clear up blur or crop) then the “acquired date” is often altered. Or, if the internal “Date” setting on the system that takes master control of the image is not accurate (Which occurs for many reasons) the acquired date of the photo will be effected. A more accurate time line could be established be speaking with individuals that had been at the park that day. For example, if you refer to SeaWorld’s FB fan page from that period, you will clearly see posts that question on the 26th and 28th, why the trainers did not perform the “Normal” show. One specifically asked if they were changing the shows and the trainers were not longer going to be in the water. Messaging some of those individuals could have provided a more accurate data set for your “time line”. The courts in this matter, or more specifically the Administrative Judge, is experienced enough to know, that when certain people want so badly to believe in nothing but the BAD things, they can and will read and creative evidence to support their theories in their own minds. I do have to say, that these blog articles are getting more and more creative as we go along, but creativity does little to aid the courts in their determinations. Hi Anne: Yes, I agree that these photos are not definitive. But this timeline is important, and it would be nice if the hearing would produce clear and direct answers on exactly when SeaWorld Florida suspended waterwork, when it resumed, when the draft incident report was first circulated, and when Scarpuzzi made the briefing on his investigation to the SeaWorld Florida training team. I am not seeking “good” or “bad” information, just facts, because the timeline so far on these very important questions has not been crystal clear. Nice reporting, Tim. Consistent evidence strongly suggests that Sea World Corporation cares much more deeply about profits than trainer or whale safety. The industry has always been run this way, and will likely continue with this model as long as it is allowed to. You have to applaud the Sea Circus PR machine; genius at carefully controlling the flow of “information” to the trainers, public and everyone in between. The cult of secrecy has allowed them to get away with this appalling industry for a long time..I say this as a former employee of The Circus. Amazing. Not seeing the timeline as relevant from a legal perspective regarding the scope of this hearing, but if OSHA investigators feel it is, then I am certain they would gain the necessary data to construct an accurate timeline. Though, I would imagine for “Facts” they will rely on more accurate information than pictures pulled from the internet. For example, I was able to locate, in less than 10 minutes, 7 videos online, that are dated Christmas day in the actual Meta Tags of the video, and all of them clearly showed a performance without waterworks. I would however, not bank on the accuracy of those for the sake of court. I would think it more accurate to rely on testimony from people present as well as security footage and logs. I am more concerned that the “Facts” be made crystal clear for the administrative judge, than I am for members of the media and animal rights faction that is so against captivity.